RSMSSB Gram Sevak Recruitment 2016 – Apply Online for 3948 Posts: Gram Sevak, Panchayat Sachiv and Hostel Warden Vacancies announced. Rajasthan Subordinate and Ministerial Services Selection Board (RSMSSB) has issued another employment notification for the recruitment of Gram Sevak and Hostel Warden posts. 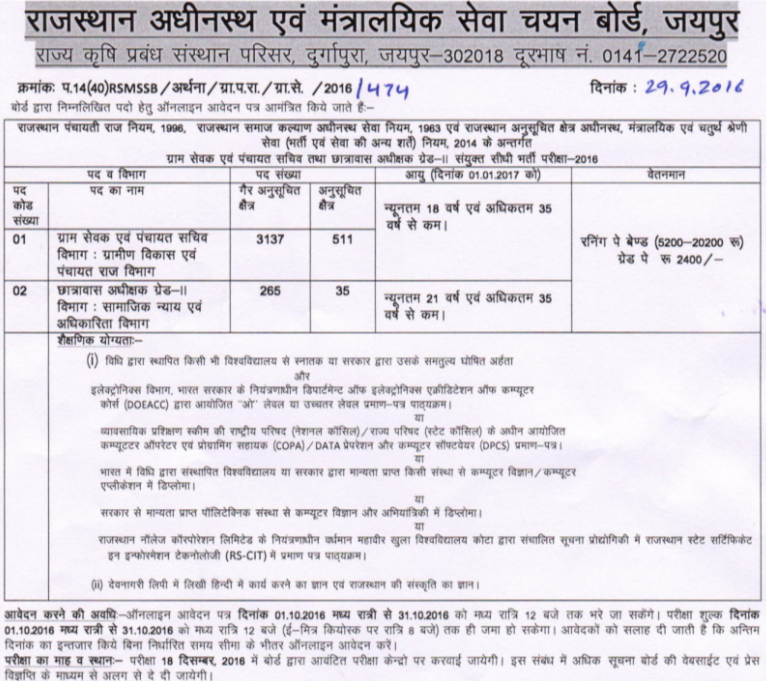 Online Applications are invited for filling up 3948 Gram Sevak, Panchayat Sachiv and Hostel Warden Grade-II vacancies. Age Limit: Candidates age should be 18 years to 35 years for Gram Sevak posts while 21 years to 35 years for Hostel Warden post as on 01-01-2017. Age Relaxation of upper age limit for Govt servants will be admissible as per Govt. Rules. Academic Qualification: (a) Candidates must possess the qualification of Graduate degree or its equivalent qualification. Candidates also should have done “O” level or above degree from DOEACC. (b) Candidates must possess the certificate of COPA/ DATA Preparation and DPCS. (c) Candidates should have qualification of diploma in Computer Application (DCA). (d) Candidates should have qualification of Polytechnic degree or B.Tech. (e) Rajasthan State Certificate (RS-CIT) from Vardhman Mahawir Open University. Apart from these qualification candidates should have Working knowledge of Hindi Devnagri script as well as knowledge of Rajasthani Culture. Application fee should be paid at e-Mitra and CSC. How to Apply: All those candidates who wish to apply for RSMSSB Gram Sevak and Hostel Warden posts in Rajasthan, they are required to apply through online mode on its website at rsmssb.rajasthan.gov.in on or before 31st October 2016. Starting Date for Apply online Application form: 01-10-2016. Last Date for Apply online Application form: 31-10-2016.